Freedom and Flourishing: How can we avoid the happiness trap? The idea that pursuit of happiness can be futile has been around for thousands of years. In my last post, I discussed J S Mill’s contribution in the 19th Century. In this post I will discuss the contribution made by Russ Harris in The Happiness Trap: Stop struggling, start living, which was first published in 2007. This book is based on Acceptance and Commitment Therapy (ACT) developed by Steven Hayes. You should be able to control what you think and feel. It would be easy for me to become side-tracked into a discussion of how prevalent the happiness trap might be. The survey evidence suggests to me that in high income countries most people are actually fairly happy, but the picture that emerges does differ depending on the way happiness is measured. For example, at a national level high levels of positive emotion are not always accompanied by low levels of negative emotion. It is also possible for a substantial proportion of the population to experience chronic anxiety and depression at some time during their lives, despite the sustained existence of relatively high average happiness levels. The important points are that too many people are falling into the trap of struggling to get rid of negative feelings and of attempting to control what they think and feel. I don’t think it is a myth that happiness is the natural state for most humans to be in: a majority of humans seem to have an inbuilt optimism bias. Nevertheless, there are times when it is natural, healthy and appropriate for humans to have negative thoughts and feelings. We cannot avoid having negative thoughts and feelings, but we can exercise a great deal of control over our responses to thoughts and feelings. Harris argues that happiness has two very different meanings. The first refers to a feeling: a sense of pleasure, gladness or gratification. The second refers to a rich, full and meaningful life. 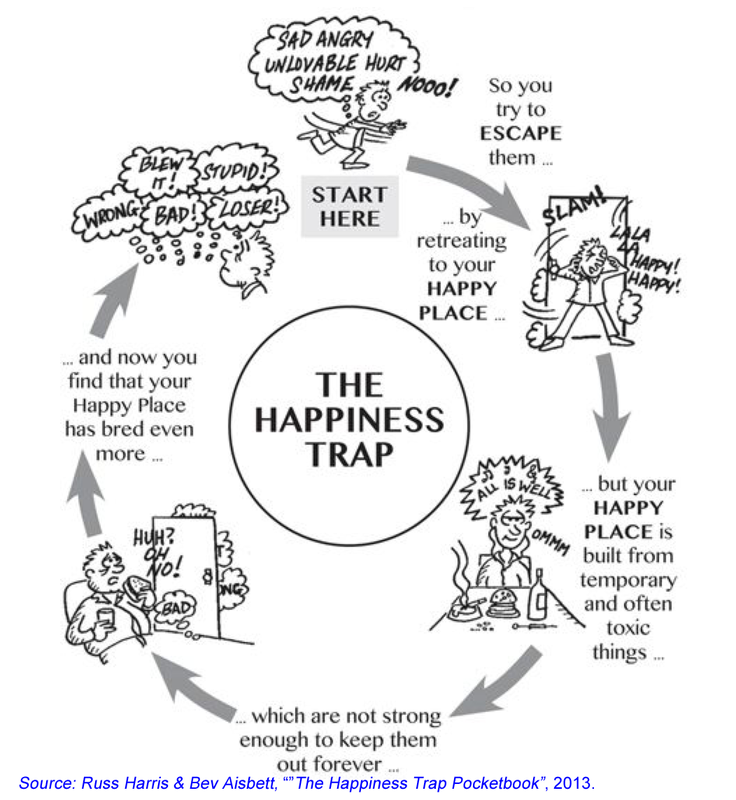 The happiness trap is associated with craving the first form of happiness. If we seek to live a full and meaningful life at various times we can expect to experience the full range of human emotions, including sadness, fear and anger. “The good news is that, although we can’t avoid such pain, we can learn to handle it much better – to make room for it, rise above it and create a life worth living”. So, how does the book suggest we go about creating lives that are worth living? As I read it, the book does this by suggesting ways in which we can exercise and develop our personal powers (or capabilities) in relation to thoughts, sensations, values and goals. The underlying idea seems to be that if we manage to cope with unhelpful thoughts and unpleasant feelings, identify and endorse the values we want to guide us, set sensible goals for ourselves, act purposefully and engage fully in what we are doing, we will end up with lives that are worth living. That makes a lot of sense to me. The approach suggested for coping with unhelpful thoughts or stories is to defuse them. The simplest technique suggested is to give yourself some distance from the thought by observing, “I am having the thought that …”. Many other techniques of defusion are suggested. One I particularly like is to thank my mind for the unhelpful advice it is giving me, and then ignore it. The approach suggested for coping with unpleasant feelings and sensations is expansion - that means making room for them rather than struggling with them. The three basic steps of expansion are: to observe the feelings and sensations in your body; breath into them; and let them come and go, or just stay there. If that sounds like Vipassana meditation, there are probably good reasons for that. “As you practice this technique one of two things will happen: either your feelings will change or they won’t. It doesn’t matter either way, because this technique is not about changing your feelings – it is about accepting them”. Russ Harris is of course not the first person to argue that we need to be guided by our values – our deepest desires relating to how we want to be and what we stand for – in order to have a rich full and meaningful life. For example, Aristotle emphasized the importance of values to individual flourishing, and Ayn Rand had John Galt develop a cogent argument leading to a definition of happiness as “that state of consciousness which proceeds from the achievement of one’s values” (Atlas Shrugged, p 1014). Harris underlines the importance of values by referring to Viktor Frankl’s observation that the prisoners who survived in Auschwitz were often not the physically fittest, but those who were most connected with something they valued such as a loving relationship with their children. Harris suggests that people identify their values in all domains of their lives: family, marriage, friendships, employment, personal development, recreation and leisure, spirituality, community, environment, health etc. Many of the questions involve asking what sort of person we want to be and what qualities we want to bring to our experiences. The next step is to set goals and action plans relating to our values for each domain of our lives. When reading about it, the process seemed as though it might be just as boring as corporate planning, but that need not be so. Findings of recent neural research (by Christopher Cascio and colleagues at the University of Pennsylvania) indicate that a focus on things we value in life - referred to as self-affirmation – is associated with greater activation in parts of the brain that are known to be involved in expecting and receiving reward (the ventral striatum and the ventral medial prefrontal cortex). A focus on what is most valued in a future context also involves more neural activity in areas associated with thinking about the self (the medial prefrontal cortex and posterior cingulate cortex). “When we move in a valued direction, every moment of our journey becomes meaningful”. I have written enough to provide a few hints about the contents of the book. My one criticism of the book (as a consumer of self-help products) is its failure to recognize that some cognitive approaches, e.g. Neuro-Semantics, can help people to adopt the frames of mind that they value, without having to engage in a struggle against negative thinking. Leaving that aside, in my view, this book has great value in helping readers to work out what they have to accept in life, what they can hope to change, and what commitments they have to make to make their lives more meaningful. Labels: Ethics and moral instincts, Frames and beliefs, Identity, inner freedom, Practical wisdom, Rationality of behaviour, unhappiness and depression, What is happiness?